Trace now knows more about the break of Lower Trestles in San Diego County than ever before. The action sports tracker ran a spot check at the Oakley Lowers Pro surf event by collecting six months of surfing data to depict wave patterns and performance trends leading into the spring competition. 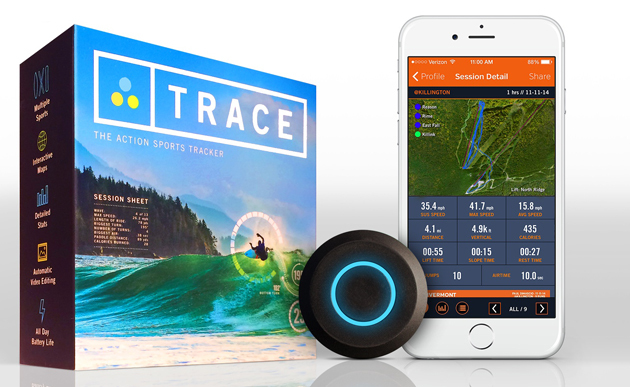 Trace—as explained in this previous Tech Talk column—uses its Reese’s Peanut Butter Cup-sized device to attach to a surfboard to record surfing metrics, such as waves, wave count, speed, length of ride, number of turns, turns in degree, paddle distance and air time. By teaming up with Oakley surfer Conner Coffin, Trace recorded rides of the Southern Californian surfer and overlaid his “heat map” on top of the break at Lowers, showing where surfers could gain the most speed and perform the most maneuvers. Trace data showed that the right side at Lowers produced a longer wave with higher speed and more maneuvers, while the left side equated to more vertical surfing with faster cutbacks and smaller turn angles. The surfer says he was intrigued to find different types of turns cost him speed, which will help him in the future to watch how hard he turns. Having the data breakdowns after a ride, he says, helped raise awareness of how to get faster and turn harder more efficiently. What else is the data good for? Coffin’s surf metrics were about more than understanding Lower Trestles. He also plans to use Trace in conjunction with his board maker—Channel Island Surfboards by Al Merrick—to test how different materials handle the waves. With data, he can back up on-board experiences to select the right combination of materials. We’ve seen data-based decisions take a massive rise in team sports already. Action sports may prove to be the next wave. We now know more about Lowers. Coffin hopes to soon know more about how board materials react in exact wave situations. Soon we’ll all know a lot more about the data behind the sport of surfing.